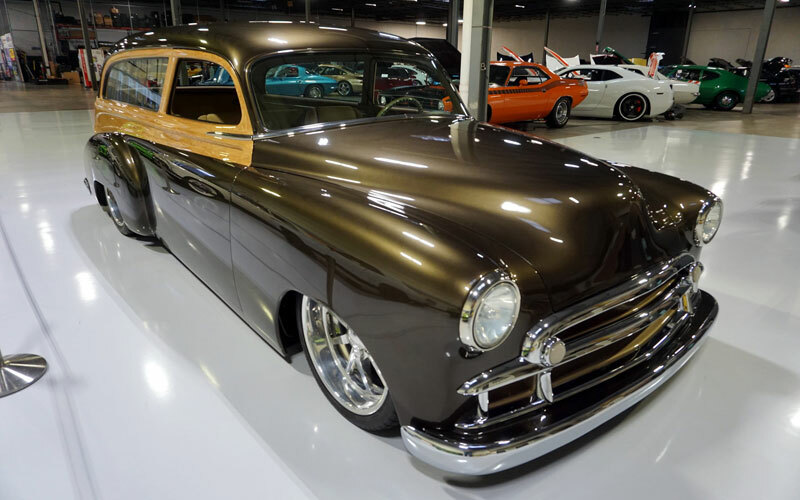 If you were at the Grand National Roadster Show in 2010 you will remember a 1950 Tin Woody Custom that stole the show. It was built by Brad Starks Customs in Paducah, Kentucky, one of Starks early builds that remains an American icon today. Starks broke the mold on Tin Woody mods. It is a legendary build that will stand the test of time. The Tin Woody is actually all steel with some very clever paintwork. Starks told us it was all done at his shop in Paducah, built for Brian Vanzant, his first big project sponsor. 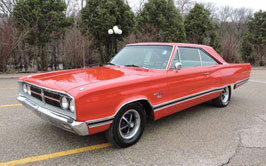 They took an original 4-door wagon from Arizona, re-designed and fabricated it as a 2-door before the top was chopped. They C-notched the front frame and re-arched the rails to give the wagon its lowered look. The Hot Hues Cappucino paint and airbrushed wood simulated paneling were also done with the help of some of Stark’s friends. 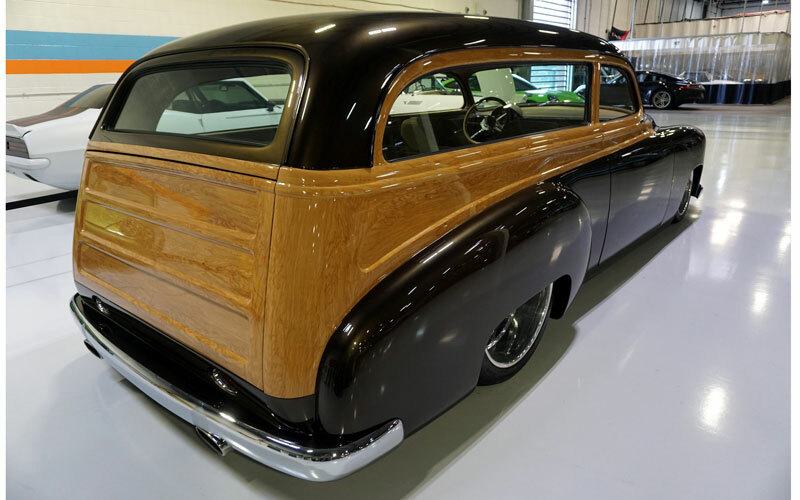 This radical custom 1950 Tin Woody is being offered for sale by R&H Motor Car Group in Solon, Ohio. (Follow this link to view dozens of high resolution photos.) 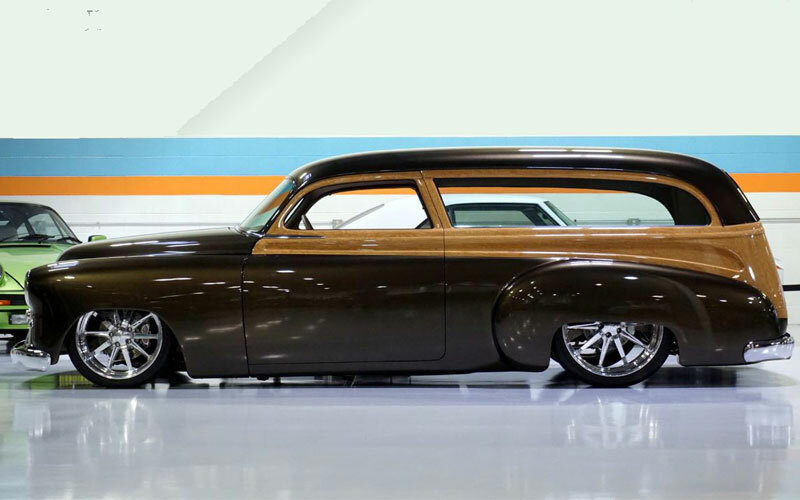 They indicate that when Starks built the classic custom Chevy wagon it cost approximately $375,000 with 6,000 hours invested in the build. It has been featured on television and in print media. They say they have all the right documentation for this absolutely stunning award winning custom. To this day there are only 65 miles on the wagon. As you approach the car you just can’t take your eyes off it. 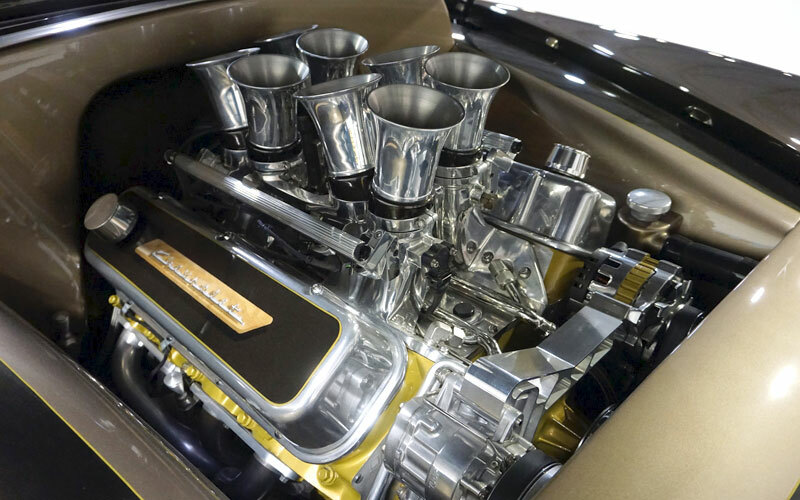 The GM 502 is fed by a Hilborn fuel-injection with stunning Brad Starks stacks and aluminum heads. It has a Gearstar 4L60 automatic transmission with B&M pumpkin shifter, a Yank 2,500 rpm stall converter and Currie 9-inch rear end. Starks built the custom chassis and used Ridetech suspension. Starks re-arched the rear end, mini-tubbed it 2.5 inches and added the Air Ride. The ten-spoke Budnick wheels were “hot” at the time. The body lines flow nicely thanks to the shaved door handles. The paint is magnificent. Even the valve covers catch your eye because of the shadowed “Chevrolet” logo. Underneath the wagon looks as good as it does on top. Painted in the same color scheme as under the hood, it glows like new. From the Wildwood brakes to the Magnaflow exhaust, to the custom line work, it is all interesting work. The interior is as simple as it is luxurious to the touch. With classic look instrument gauges above the steering column, the speedometer is on the floor just ahead of the shifter. Air Ride controls, radio controls and power window controls as nested inside the arm rest. Matching wood grain inserts are seen in the door panels, headliner and rear floor. You can see why this car became a multiple award winner. This is no cookie cutter custom. This is one-off custom people remember. In fact, it has won awards at some of the top venues in the custom car hobby including: Radical Wagon award at the 2010 Grand National Roadster Show; Detroit Autorama Best Custom award; Goodguys Custom Rod of the Year 2009; World of Wheels Best Custom Rod, Louisville, KY; and was a Pro’s Pick at the NSRA Nationals. In 1949, Chevrolet (just like Buick and Oldsmobile) offered the wood-bodied wagons at the beginning of the model year. But at mid-year they introduced an “all-metal” construction body station wagon with Dynoc wood simulation trim. There had been a lot of feed back that buyers were shying away from wood bodied wagons because of the high maintenance costs of wood. The wood had to be sanded and re-varnished every two years to keep it in top condition. Other wise they tended to rot. In 1950 Chevrolet went to an all-steel construction wagon with faux wood panels. Their four-door, eight passenger wagon became very popular. It was just what the market wanted. Chevrolet station wagons sold 166,995 units that year.